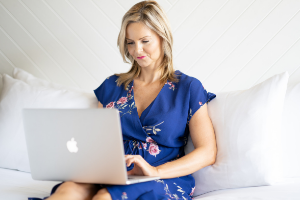 Sarah is blazing a trail for conscious awakening women with divinely guided strategies to create a balanced, healthy, holistic, and aligned lifestyle to catapult their life, health + business! As an intuitive transformation coach, holistic life-stylist, and wellness consciousness expert, Sarah is a transformation catalyst to women worldwide who want to take their life experience beyond what they thought possible. She is your no BS + wise spiritual Soul sister you’ve been looking for! Her genius is facilitating Soul-shifting breakthroughs and transformations to help you clear patterns and habits keeping you stuck so you can unleash your magic. Sarah combines her gift as an intuitive channel, with her background in the holistic healing arts and applied spiritual psychology, plus 17+ years of entrepreneurial and business experience to help women and creative entrepreneurs alike. After Sarah’s spiritual awakening in 2013, she was guided to heal her life and as a result, aligned with her purpose to bring practical spirituality and ancient wisdom to modern times. As a coach, mentor, teacher, healer, and speaker her mission is to make practical spirituality and ancient wisdom mainstream through proven, simple, and step-by-step processes. She also currently mentors creative entrepreneurs on divine business strategies such as the “lighthouse effect“, an energetic marketing strategy to help clients magnetize their message and attract the people they are here to serve on a Soul level. She also teaches on her 4 Step Yin/Yang Sales Cycle to avoid burnout and overwhelm, an energetic strategy for less hustle and more flow while growing your business. Sarah also loves teaching her 7-Pillar Manifesting Formula and how to tap into Soul guidance for instant clarity and creativity. Currently living in Phoenix with her 2 dogs, Sarah attracts a loyal online community of women curious about what she teaches next. Sarah is a true thought leader in her industry of conscious entrepreneurship, spiritual growth and self-mastery. Click here to work with Sarah.